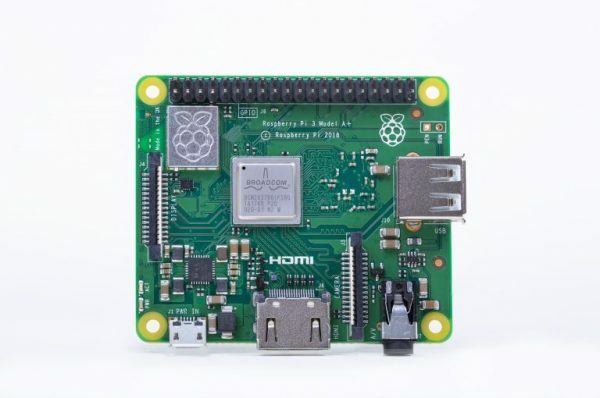 The Raspberry Pi Foundation released a new cheap SoC, the Raspberry Pi 3 A+. This model costs a scant $25, but offers many of the same features found on the $35 B+. Perhaps most notably, the SoC now includes the same quad-core ARM processor, making it much more multitasking friendly. I mean, it’s still a Raspberry Pi, but it’s a big step up from the single-core A+ board it’s replacing. So what did they have to cut in order to reduce the price? The biggest detriment compared to the more expensive Raspberry Pi B+ is a lack of RAM. The B+ comes with 1GB, while the A+ has only 512MB. I would be really hesitant to put any kind of a GUI on this computer, and will force people to think hard about what kind of applications this can be used for. The other major loss with the A+ is the loss of an Ethernet port and 3 USB port, it now has just a single USB-A port. This is more of an inconvenience than a true loss. Given that Ethernet speeds are limited to the single USB 2.0 bus on the Pi, it was always severly constrained on the device. Unless you’re putting the A+ Pi in something that requires the lowest latency, Wi-Fi will do fine. Especially since this supports dual-band 2.4GHz and 5GHz 802.11ac. The Raspberry Pi 3 A+ doesn’t really change the story for what these devices can be used for. In a pinch they can serve as a poor man’s Linux desktop, but that’s really a nice bonus. These are really meant to be an open platform to build on. That’s why the GPIO pinouts and camera connector are included. What’s really interesting is that the Raspberry Pi Foundation continues to fill out an interesting spectrum of low cost computing devices. This starts with the ridiculous $5 Raspberry Pi Zero for your truly minimalist compute needs, all the way up through the “luxurious” Raspberry Pi 3 B+. It’s an impressive little family.